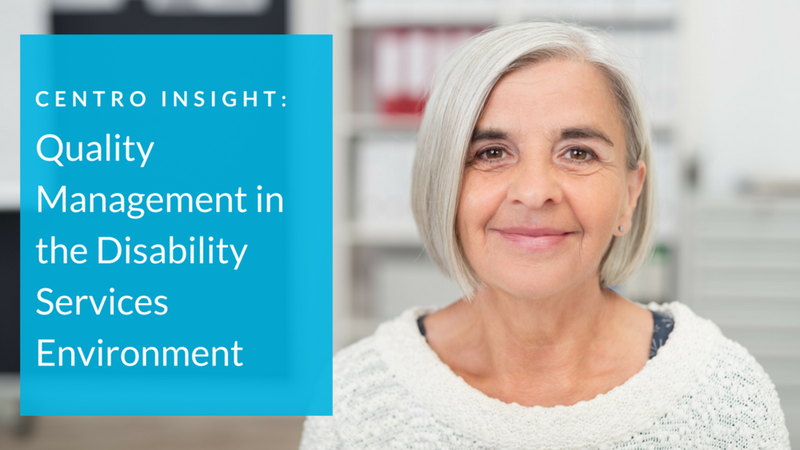 The change to the NDIS in the disability services provider market within Australia has forced providers to look at their viability and quality standards, and organisations must adapt to a new person-centric business model or perish. The disruption means services now have stricter pricing controls and there are considerable administrative overheads in everything from requesting payment for services, to meeting the quality standards. These have contributed pressure to the bottom line. Most providers have responded positively to this by looking at ways to improve productivity; however there are still opportunities to streamline operations further. Quality management is a term that will become familiar in this new landscape as organisations focus on processes and systems and put plans in place to monitor, review and communicate the quality of services, supports or products. Additional to this, providers must now ensure that they have registered their services correctly in the new system and that their organisation complies to the new National Quality and Safeguarding Framework in the near future. From our experience we believe a strong commitment to quality management involves your staff using a process and systems approach. This encourages consistency, streamlining and standardisation of business processes to assist the organisation make evidence-informed decisions. Business leaders know this means that additional effort is required to educate their existing personnel and to develop new material to guide and manage their employees and volunteers. This is an investment that many organisations had not planned for as they transitioned to the NDIS. New employees need to be onboarded quickly so that services can be delivered consistently and to a quality standard that upholds the principles of the NDIS. Without a business process that actively monitors who within your organisation has or hasn’t accessed the required guidance material it will be costly and time consuming to remind staff. Our approach is to automatically manage timely communication, with up to date best practice guidance and systems matching the obligations of service providers under the NDIS, thereby shortening the time and effort required to create and maintain guidance material. Compliments and complaints are equally important to organisations. Both will drive continuous improvement and the Standards require providers to offer proactive feedback systems, dispute management processes and act on that feedback when reviewing services and support. Mechanisms used to ensure independent review. We have pre-populated standard processes, such as the Complaints Process to ensure that the feedback is recorded, activity is logged and reportable. This makes compliance with the standards and policies transparent to staff and the Commission. Organisations need to learn from accidents and incidents as they happen. Reporting incidents ensures that corrective action can be taken; data can be collected to see if it is a systemic risk and the impact on the person, their family and community, can be investigated. According to the NDIS Quality and Safeguarding Framework, 9 December 2016, “Providers have primary responsibility for preventing and managing serious incidents, so they are expected to have processes for this as part of their risk management system.” Registered providers will need to demonstrate that they have internal systems and are able to record incidents. Standardizing the process will remove any confusion over what is required and we can assist providers in meeting their obligations. Not complying has serious consequences and implementing Centro ASSIST™ will ensure you use technology to bring Quality management standards into your organisation.